Flavourful fun can be easy too! 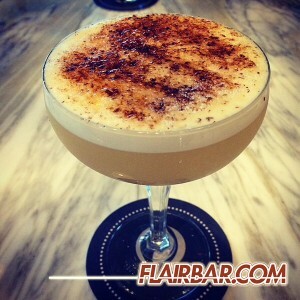 Flairbar.com sent me some awesome simply squeeze syrups and this is a delicious and flavour packed cocktail I created with one of them. 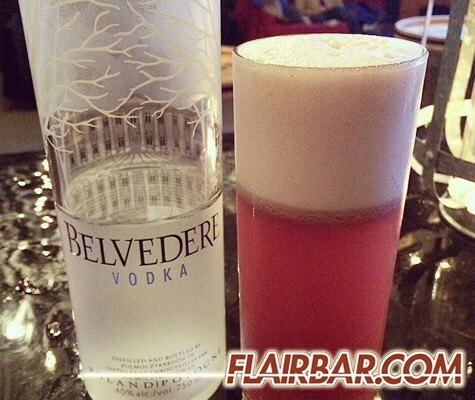 Procedure: In a mixing tin add your Belvedere, Simply Squeeze Raspberry puree, lemon juice and egg white. Fill your mixing tin with ice and shake vigorously. Strain out the ice and shake again to create froth. Double strain your cocktail into a tall Collins glass. Once the foam has begun to settle add cold soda water from a few inches above the drink slowly. The froth will expand until it is resting just above the rim of your glass. Enjoy! The Beavertail is Canada’s answer to the Elephant Ear: delicious fried dough dusted in sugar and cinnamon. This drink is my tribute to delicious fried dough that warms your soul on cold winter days spent out in the snow. To make the syrup simply make a tea of fresh vanilla beans and cinnamon sticks with boiling water. After steeping for about 10 mins, strain out the vanilla and cinnamon and add an equal measure of sugar. Blend well and chill before using for best results. Procedure: In a mixing tin add your whiskey, syrup and whole egg (no egg shells ). Add ice and shake your cocktail vigorously, strain the ice out and shake again to create froth. Double strain into a chilled coupe glass and allow the foam to settle. Once settled lightly sprinkle sugar over the top of the cocktail evenly, finish by dusting the cocktail in ground nutmeg. Garnish: To create the brûlée top, use a culinary torch and gently toast the sugar until it turns golden brown. Add sugar and toast again as necessary. The Toronto is a boozy, spirit-forward cocktail with complex notes provided by the Fernet. Originally made with simple syrup I decided to make a cocoa tea syrup using some vintage cocoa tea bags I found at work. The sweetness of the chocolate and bitterness of the tea perfectly compliment and soften the Fernet. 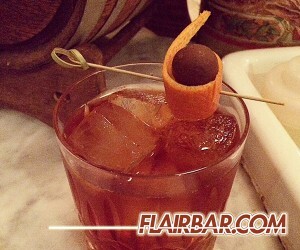 Try this cocktail both ways and see which you like. Procedure: In a mixing glass add the rye whiskey, syrup, Fernet-Branca and bitters. Add ice and stir well (very well). This cocktail is best when very chilled and diluted. Strain the cocktail over fresh ice, garnish and serve. Garnish: Classic garnish for this cocktail is an orange zest. If you go for the cocoa tea and a piece of chocolate for the guest to enjoy.